王丽敏, 陈志华, 张梅, 赵振平, 黄正京, 张笑, 李纯, 关云琦, 王璇, 王志会, 周脉耕. Wang Linmin, Chen Zhihua, Zhang Mei, Zhao Zhenping, Huang Zhengjing, Zhang Xiao, Li Chun, Guan Yunqi, Wang Xuan, Wang Zhihui, Zhou Maigeng. Wang Linmin, Chen Zhihua, Zhang Mei, Zhao Zhenping, Huang Zhengjing, Zhang Xiao, Li Chun, Guan Yunqi, Wang Xuan, Wang Zhihui, Zhou Maigeng. Study of the prevalence and disease burden of chronic disease in the elderly in China[J]. 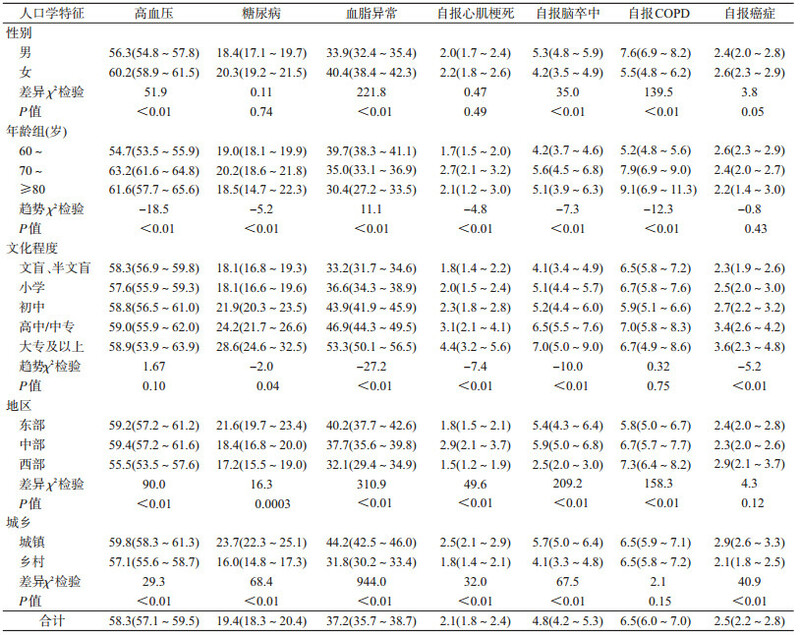 Chinese Journal of Epidemiology, 2019, 40(3): 277-283. Abstract: Objective To understand the prevalence and disease burden of major chronic diseases in the elderly in China and provide scientific basis for the prevention and control of chronic diseases and for the rational allocation of health resources. Methods We analyzed the prevalence of chronic diseases in residents aged ≥ 60 years in China by using national and provincial surveillance data of chronic diseases and related risk factors in China. We conducted the analysis on the burden of chronic diseases in the elderly in China by using the data of global burden of disease. 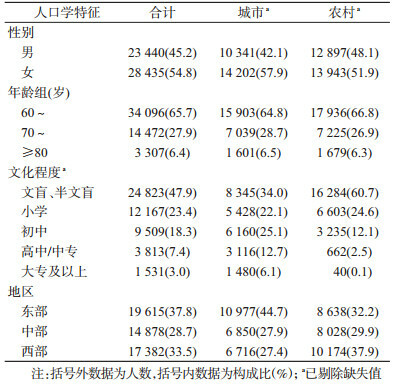 Results The prevalence rates of hypertension, diabetes and hypercholesterolemia were 58.3%, 19.4% and 10.5% respectively in residents aged ≥ 60 years in China. Up to 75.8% of the residents aged ≥ 60 years had at least one chronic disease. The prevalence rate was higher in women than in men, higher in urban area than in rural area. With the increase of age, the prevalence rate of chronic diseases also increased. The top three chronic diseases with heavy disease burden in residents aged ≥ 70 years were stroke, myocardial infarction, cancer and chronic obstructive pulmonary disease. Conclusion The prevalence of major chronic diseases in the elderly is high with three quarters of the elderly suffering from at least one chronic disease, and the burden of chronic diseases is increasing. 中华医学会糖尿病学分会. 中国2型糖尿病防治指南(2013年版)[J]. 中华内分泌代谢杂志, 2014, 30(10): 893-942. 王建生, 姜垣, 金水高. 老年人6种常见慢性病的疾病负担[J]. 中国慢性病预防与控制, 2005, 13(4): 148-151. 曾新颖, 李镒冲, 刘世炜, 等. 1990-2015年中国四类慢性病早死概率与"健康中国2030"下降目标分析[J]. 中华预防医学杂志, 2017, 51(3): 209-214. 卫生部统计信息中心. 2008中国卫生服务调查研究[M]. 北京: 中国协和医科大学出版社, 2009. Statistical Information Center of Ministry of Health. 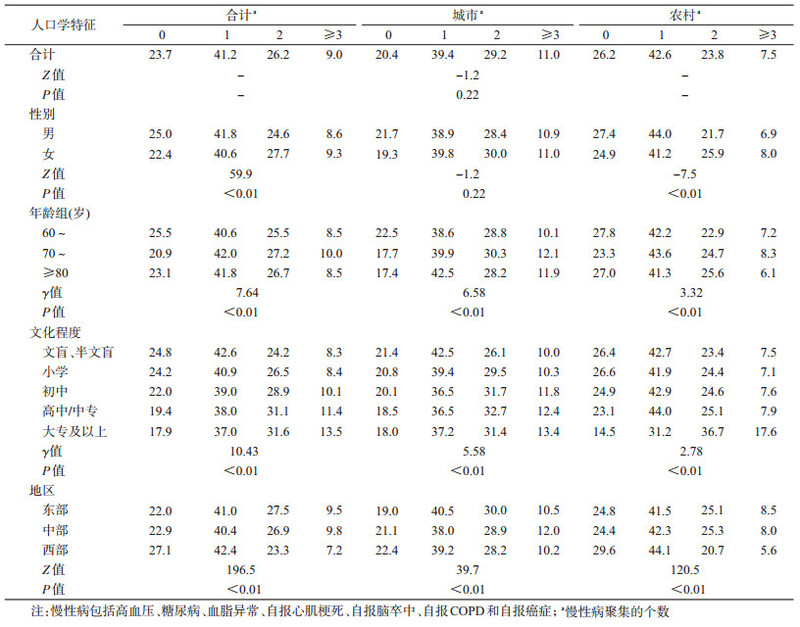 An analysis report of national health services survey in China, 2008[M]. Beijing: China Union Medical University Press, 2009. 中国疾病预防控制中心慢性非传染性疾病预防控制中心. 中国慢性病及其危险因素监测(2010):老年健康专题报告[M]. 北京: 人民卫生出版社, 2014. Center for the Prevention and Control of Chronic Non-communicable Diseases, China Center for Disease Control and Prevention. Report on the status of elderly health:chronic disease risk factor surveillance in China 2010[M]. Beijing: People's Medical Publishing House, 2014. 杜宏伟, 刘霖, 王建华, 等. 老年高血压合并糖尿病患者血压血糖水平与颈动脉粥样硬化的相关性[J]. 中华高血压杂志, 2012, 92(18): 1236-1239. 国家卫生和计划生育委员会统计信息中心, 中国疾病预防控制中心. 中国居民预期寿命及危险因素研究报告[M]. 北京: 中国协和医科大学出版社, 2017: 6. Statistical Information Center of National Health Commission of People's Republic of China, Chinese Center for Disease Control and Prevention. Life expectancy and risk factors for Chinese Residents[M]. Beijing: China Union Medical University Press, 2017: 6. 周脉耕, 李镒冲, 王海东, 等. 1990-2015年中国分省期望寿命和健康期望寿命分析[J]. 中华流行病学杂志, 2016, 37(11): 1439-1443.